Gary Ausman may have graduated 50 years ago and retired from the UW 15 years ago, but you wouldn’t be able to tell that by looking at his schedule. The recipient of this year’s UW Alumni Association Golden Graduate Award finished his career-long tenure at the University as director of the International Services Office in 2002—only to return to campus the next year as the director of the Western Golf Association, an organization that sponsors the Evans Scholars Foundation’s scholarship for golf caddies. It’s almost like he never left. Because he hasn’t. 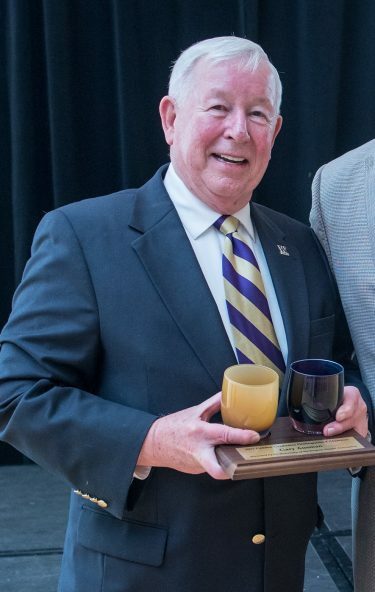 In addition to serving as a liaison between the UW and the Evans Scholars (a program that has no connection to the Evans School of Public Policy & Governance), Ausman, ’63, ’74, continues to serve as an emeritus director of the campus Interfraternity Council. “I just can’t get away from it. As long as I’m perpendicular, I’m going to keep doing it,” he says. That’s a big change for a local who admits that he was once intimidated by the thought of attending school here. He put off college for two years by enlisting in the U.S. Coast Guard. When he did come to the UW, he ended up taking five years to graduate with a degree in geography and a teaching certificate. He likely would have remained a teacher had he not become president of a fraternity and served on the council where he brushed shoulders with such notables as Public Affairs Dean Brewster Denny, ’45; Dean of Men Reginald D. Root; and Assistant Dean Alvin E. Ulbrickson Jr., ’52, ’63, ’67. Once Denny influenced him to leave his teaching position in Renton to earn a graduate degree from the Graduate School of Public Affairs, now the Evans School of Public Policy & Governance, he never looked back. His 35-year career started with a part-time job as assistant dean of men and ended with a 27-year stint as director of International Services Office. “Once I got into that culture, I found that I really enjoyed the people with whom I worked. They were very, very bright and very dedicated. I enjoyed working with the students. I think they kept me young,” he says. Ever the overachiever, Ausman also served as faculty adviser to the Western Golf Association’s Evans Scholars Program, was on the board of directors of the Foundation for International Understanding Through Students as well as the board of directors of the UW Professional Staff Organization. If that weren’t enough, he continued to advise fraternities along the way. Eventually, he says, “I was told by a vice president to cease and desist with the fraternities.” So the fraternities turned around and made him director emeritus for life. Even now, he continues to be a strong advocate of the Greek system because he believes that the support the fraternities and sororities provide increases the likelihood their members will graduate. He was on the board of directors for the UW Retirement Association and served as president in 2014. He remains bullish on working at the UW, even if much of it is only on a volunteer basis. David Volk is a freelancer for Columns Magazine.